Bhagavan Das, 1960's counterculture icon, was prominently featured during the Temple of Sound Weekend held at Amrit Yoga Institute of Central Florida. A spiritual teacher, musician and performer, the guru was accompanied by his wife, Kali, during a Friday night presentation. Many follow such teachers in hopes of more healthily integrating life experience with deeper understandings of the nature of reality. Bhagavan Das is credited with mentoring Ram Dass and opening for the Grateful Dead, among other items of note. More about the Friday night performance is described in my post, Bhagavan Das at Amrit Yoga Institute, at Orlando Paranormal Examiner. A 1990 report prepared by the Institute for Defense Analyses (IDA), an organization based in the US, stated that the military use of unmanned, remotely controlled air vehicles began no later than World War I. The report was presented to the Defense Advanced Research Projects Agency (DARPA) and explained that remote controlled aircraft were operational during the 1920's in both the US and the UK. The craft were initially rather limited in scope, the IDA reported, but by World War II radio-controlled aircraft were being upgraded to include cameras. Such efforts continued through the Korean War. The Nite Gazelle, deployed during the Vietnam era. A similar 2003 IDA report provided an overview of DARPA unclassified program activities since the 1970's. Unmanned aerial vehicles were given significant attention, including the wide use of remotely piloted vehicles, or RPVs, during the Vietnam War. RPVs successfully carried payloads, conducted reconnaissance, executed precision strikes and other advantageous maneuvers over SE Asia. In 1971 an apparently rather brilliant model airplane enthusiast, Dr. John Foster, recommended DARPA scrap its designs and turn its attention to producing, more or less, souped up model planes. The cleverly simple concept initially resulted in the Praerie and Calere, each weighing about 75 pounds and powered by, of all things, lawn mower engines. Numerous additional models were subsequently produced. Their increasingly sophisticated capacities included reduced radar signatures and the addition of electronic warfare capabilities. All was not always as stellar as the Department of Defense would have liked, however. IDA reported that the DARPA-Army collaboration on Praerie led to the Army's Aquila Program, a venture infamous for its lack of practicality. Essentially, confusion developed within the ranks as to how Aquila should be deployed. IDA reported that a lack of cooperation between the branches ultimately undermined the program. Many believe it is such challenges that led to agencies such as DARPA and the CIA taking the lead in drone advancements, as opposed to allocating such operations to the services. Production efforts of unmanned aerial vehicles continued, leading to projects such as Amber. The 1990's saw transitions from Amber into programs known as Tier I, Tier II and Tier III, representing production of drones with systematically increased capacities for stealthy flight, electronic warfare and lethal weaponry. Drones were used in Iraq, Afghanistan and are of course deployed in current intelligence operations. They are also becoming more widely used in a variety of law enforcement and rescue operations. The Associated Press recently reported that the Pentagon is creating a new prestigious medal for extraordinary achievement in cyber and drone warfare. It is the first addition of a medal since 1944. Many analysts suggest it exhibits an urgency allocated to high levels of performance and success in the field. Whatever we may make of the ongoing saga of unmanned aerial vehicles, they are obviously here to stay. We can only speculate what related information may remain classified and to what extents it has effected ufology, but it might be advisable to take into consideration now and then. Let's think about this disclosure thing a bit. As I understand it, there are some guys that consider themselves activists in something they call exopolitics. Those guys tell us we should join them in demanding Washington spill the beans they have long hoarded about aliens among us. I have some questions. Why give the US government so much of the credit when it comes to keeping the lid on aliens? Can't the exos think of anywhere else to look for answers about the UFO phenomenon, anywhere at all? Have any of those activists talked to Greer? Like, has anyone championing disclosure demanded Greer disclose data? Wouldn't it stand to reason that if you're spearheading public disclosure of the truth about aliens, you'd drop a guy an email that claims to have one in a box? If not, why not? Okay, forget Greer. That situation is only of interest due to its continued public support in the face of such profound absurdity. How about the Mutual UFO Network? Those guys and gals have been chasing saucers longer than some of us can remember, and it's tougher to get straight answers out of some of them than verification of election results from a third world country. Why aren't disclosure activists complaining about MUFON secrecy and double standards? Wouldn't it stand to reason that anyone sincerely interested in the truth would be hammering The Captain and the MUFON board of directors with the same persistence in which they hound White House staff? Maybe the only thing MUFON could tell us was that after having bird-dogged thousands of UFO sightings and reports of alien abduction, it has absolutely no conclusive evidence whatsoever of any aliens. Even if that were the case, wouldn't that be something you would think should be published in the spirit of disclosing the truth? Another thing... Genre icon Whitley Strieber claimed he has an implant in his ear. He also claimed it repeatedly dodged a scalpel during a doctor's attempts to remove it. Have any disclosure activists demanded Strieber disclose corroborating data? Why not? Wouldn't taking a look at the man's ear, or at the least asking him to cough up related data, seem like much more practical uses of resources than trying to send a million faxes to Washington? That would seem to be the case, anyway, if one were genuinely interested in the disclosure of actuality. Have any activists made repeated demands of Robert Bigelow? Shouldn't they demand that he, like Uncle Sam, come clean in the name of truth, the public's right to know and all that? Aren't they curious what's in his files? Rational individuals will simply suspect self-described disclosure activists are insincere, naive or without objectivity until circumstances such as questioned above are adequately addressed. Those activists might, however, continue to be rather successful at getting irrational individuals to climb on board. The entire situation is unfortunate in that it stands to further divide the UFO community into its poorly conceived – even if comfortably preferred - sects of debunkers, believers and so on. It's the old 'you're either with us or against us' strategy, exploiting people into adopting naively simplistic perspectives in which intelligent inquiry is neither required, rewarded nor allowed. There are aliens. The White House knows. Demand they say so. There ya go. What more of a platform could you want out of an activist movement? as reported by ABC News. NBC News reportedly obtained and subsequently published a previously confidential Justice Department white paper concerning the use of deadly drone strikes on American citizens. The paper addresses guidelines and circumstances for executing such strikes. Human rights advocates are concerned the guidelines are poorly defined and leave far too much room for interpretation. This creates a situation, they claim, conducive to ill advised and otherwise unlawful assassinations and executions. Concern is also being voiced that officials are publicly averting from discussion of such loosely defined procedures while implementing their use behind closed doors. Contrastingly, those who support the policies outlined in the paper argue that such measures are required in order to enable the Justice Department to act in timely and effective manners. Severe circumstances call for severe measures, they suggest. Meanwhile, John Brennan, nominated by President Obama to direct the Central Intelligence Agency, will soon appear before the Senate Intelligence Committee to discuss his nomination. Brennan has acted as Obama's chief counterterrorism consultant while serving as Deputy National Security Advisor and Assistant to the President for Homeland Security and Counterterrorism. He is credited with designing what have come to be known as US drone assassination programs. The drone projects are reported to be controversial and complex, largely consisting of circumstances unknown to the American public. When the intelligence community becomes involved in movies and ufology, for whatever reasons, it matters to the interested demographics. That is the case whether or not the selection of the genre matters in the least to the IC, and their involvement initiates chains of events that unfold in any variety of relevant manners and directions. I invite readers to consider the extents investigators may commonly be missing the mark when contemplating IC involvement in sci fi and ufology, at least if the 'Argo' operation is much of an indicator. For instance, fans of 'Lord of Light' would have been concerned about the script whether or not the Agency cared any at all about the subject matter. UFO buffs and similar such demographics stood to be interested in both the purchase of the script and most certainly about the fact the CIA was involved. After all, you're reading this, aren't you? I suggest there is relevant established precedence in the 'Argo' circumstances as declassified by the Agency and subsequently explained by Tony Mendez and reported by Joshuah Bearman. I further suggest there are lessons to be learned. I submit for consideration that had certain parties discovered in 1980 that the 'Lord of Light' script was purchased and subsequently canned by the CIA, at least one of the evolving theories would have included the oversimplified suspicion that the Agency was attempting to discourage interest in the subject matter. While having only a partial view of a bigger picture, some might very well have suggested that, in essence, the powers that be were hiding the supposed truth contained in a tale of cosmic conflagration. An apparently incorrect assumption, or at the least an oversimplified perspective, of a UFO cover-up was ripe for the picking. There would have been additional theories, many of which would have related in some fashion to the IC asserting itself in UFO circles. My point being that speculation would abound and completely regardless of what interests, if any at all, the CIA actually had in the subject matter of the script. Once such chains of events are set in motion, the domino effect is on. Moreover, I invite consideration of how events might unfold if the 'Argo' operation were not yet declassified. Perhaps at some point an ambitious investigator might suggest further research was justified into the possibility Studio Six had been a CIA front. Perhaps that same investigator might correctly suggest the 'Lord of Light' script was obtained for purposes related to deception operations in the Middle East. Would it not be reasonable to suspect that many would ironically call the investigator a fanatical conspiracy theorist, virtually regardless of the quality of research put forth? An irony, indeed, particularly considering the likelihood a high percentage of the investigator's critics would so adamantly subscribe to a conspiracy of ongoing and orchestrated UFO cover-up. Perhaps the IC, at least at some points in time, placed its members in ufology for reasons other than their stated purposes. Maybe they indeed networked and developed connections to support hidden agendas. There is certainly precedence to suggest such. As with Mendez and his Hollywood collaborators, there would not be any single, long term specific purpose for such operations as is often mistakenly oversimplified and commonly argued to be the case, but many different general purposes as times change and objectives dictate. The primary reason I think further consideration should be given to the likelihood members of the IC in ufology conducted covert activities is rather simple: they are here. 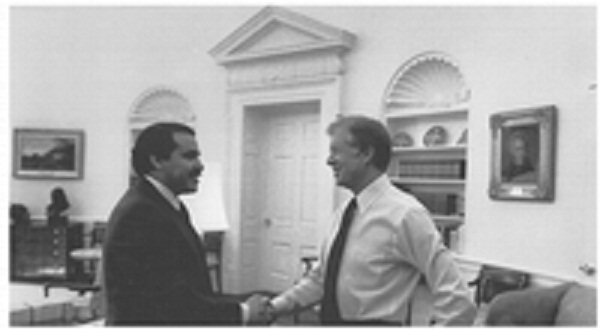 Tony Mendez and President Jimmy Carter circa 1980. Certain deception operations overlap with science fiction and UFO subject matter, as confirmed in the case of 'Argo' and as cited by Mark Pilkington in his work, 'Mirage Men'. It is apparent and would stand to reason that some similar operations remain classified. Tight lips surrounding such currently classified operations would further fuel the fires, intentionally or otherwise, of supposed UFO cover-up, gradual disclosure and so on. In actuality, such circumstances are apparently substantially more likely to be related to such matters of state as clandestine aircraft and deception operations than alleged alien spacecraft. This appears to be the case in spite of what sometimes overzealous, naive or possibly even blatantly dishonest UFO disclosure activists would have us believe. Repeatedly demanding the White House fully address such circumstances and classified operations, or at the least pretending to believe doing so might soon result in anything more rewarding than successful fundraising, is a whole 'nother topic of fallacy and deception unto itself. I am not suggesting that one is necessarily ill advised to research possibly paranormal events. Neither am I suggesting that what has come to be known as the UFO phenomenon is necessarily void of any such paranormal events. Competent researchers may produce increasingly significant results of such possibilities and I would be most interested should that prove to be the case. That stated, we indeed know the IC developed a presence and resulting influence in both science fiction film and the closely related genre of ufology. We therefore need not establish IC involvement in the UFO community, but accurately gauge its extent and impact. If the challenge is deciding what to believe, then the solution is requiring accountability. To be clear, I am not talking about counter productively badgering elected officials or unfairly discrediting sincere witnesses. I am talking about requiring accountability of people claiming to be qualified to provide conclusive information about UFOs, aliens, disclosure and the like. Information can generally be placed into one of three categories: that which has been verified as accurate, that which has been demonstrated to be false, or that which requires suspension of judgment pending further investigation. If we remain mindful of such circumstances when contemplating the credibility of any given statement or concept, it would seem we would consistently increase our likelihood of forming accurate perspectives. Perhaps the next time we click on a podcast or attend a lecture about ufology that features a member of the intelligence community, we might consider the many, many possible reasons they could be present – far and above those they claim and those commonly supposed. Whatever we each may choose to think, the 'Argo' saga provides us with an intriguing glimpse into intelligence operations. It offers us confirmation of one of the more interesting cases of IC tampering in sci fi and UFO-related subject matter yet declassified, the operative word very possibly being 'yet'.